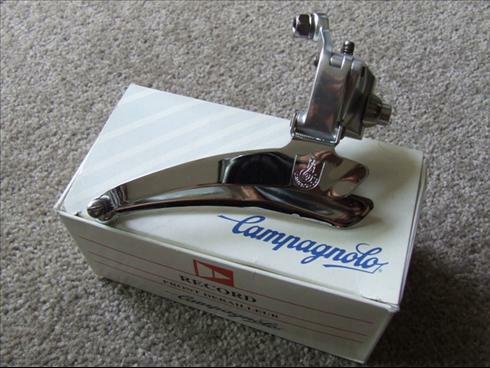 Campagnolo Record Front Derailleur introduced in the 1993 Catalogue. There were 2 models:- Braze On (FD-11SRE) & Clip On (FD-11FRE). A unique feature of this front derailleur is the cable fixing bolt is 5mm thick and you can use either a 9mm wrench or 5mm allen key to tighten/loosen the fixing bolt. Details: Introduced in 1991, the Campagnolo Record group was the first of Campagnolo's groups to include Record Ergopower shifters (released in 1992), integrated brake levers and shifters. These parts however are not within the focus of this website. A photo of this part is shown here for completeness, all other parts from this group will be included in the main listing. In 1991, there was also a very rare 'Century' or black-gray finished version of the Record group. Only 300-500 groups were sent to the United States and is very rare around the world.